Why Choose Our Pocket Square? ►HOLDS YOUR POCKET SQUARE FIRMLY IN PLACE: This little fashion forward accessory can keep your pocket squares right where they should be. From now on you don't need to worry about squares sliding back down into your pocket. ►SUITABLE FOR ALL KINDS OF POCKETS AND SQUARES: The size is specifically measured to fit in all kinds of breast pockets (tuxedos, blazers, sport coats etc. ); also, it works perfectly with various pocket squares or handkerchiefs in diverse shapes and forms. ►PORTABLE AND EASY TO USE: It's super slim and light-weighted. You can't even notice it's there when you wear this little thing and go about your day; simple instructions are included in the package so that you can learn how to use it instantly. ►STURDY MATERIAL AND EXCELLENT DESIGN: The material of this pocket square holder is specially chosen to maintain its hardness; designed with smooth edges all around so that it won't damage your skin or catch on anything as your put it into your pocket. 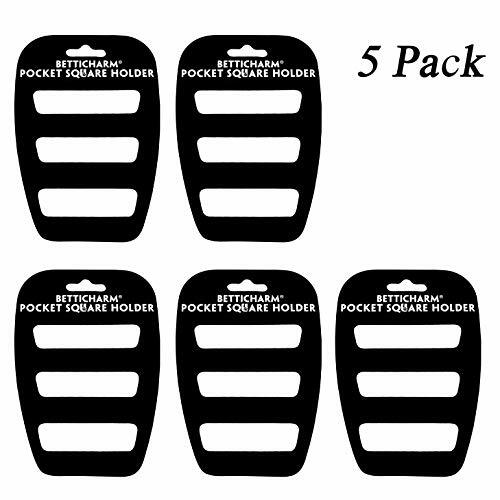 ►These pocket square holders are offered under REGISTERED TRADEMARK "BettiCharm" with a design patent. Any counterfeit products and infringements will be reported. If you have any questions about this product by BettiCharm, contact us by completing and submitting the form below. If you are looking for a specif part number, please include it with your message.